Ultimate Tanzania offers you the unbeatable vacation combination of wild adventure and supreme, uninterrupted relaxation. First comes the adventure. Your safari across Tarangire National Park will bring you close to hunting lions, grazing elephants and huge numbers of indigenous birds. 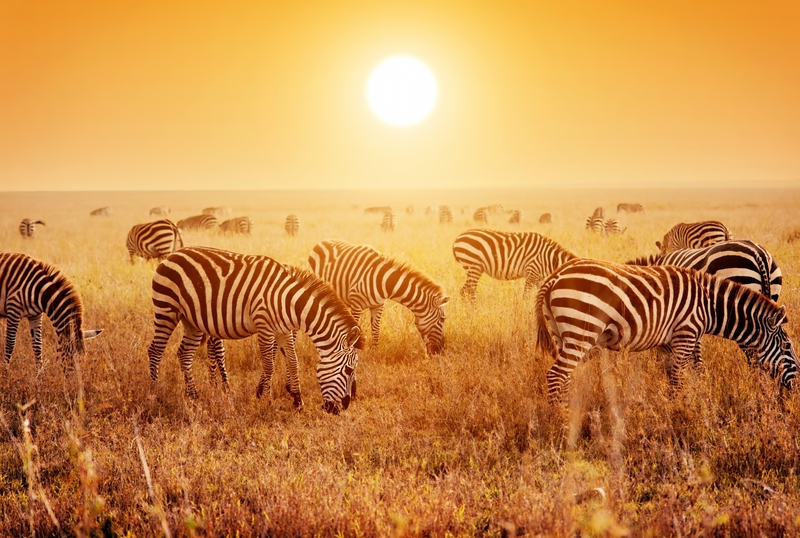 After Tarangire, the Ngorongoro Crater beckons with its stunning views and incredible concentration of wildlife – over 25,000 animals roaming freely across a 19km wide caldera. But nothing quite prepares you for the Serengeti. Here, vast herds of wildebeest, zebra and gazelle – numbering a million or more – join the annual migration. And then it’s time to relax at a wonderfully luxurious beach resort on the exquisite island of Zanzibar. Economy flights and full board at Legendary Lodge, Chem Chem Lodge, Gibbs Farm, Mwiba Lodge and Xanadu Villas. Based on two people travelling. Arriving in Kilimanjaro from London, you will be picked up from the airport and transferred to your hotel situated on a working coffee plantation on the outskirts of Arusha. With gourmet meals, rejuvenating spa treatments and superb views of Mt Meru, it’s the perfect spot to recharge after your flight. Today you will be transferred to Chem Chem Lodge, an exclusive property with an unbeatable location between Lake Manyara and Tarangire National Park. An area that boasts a truly staggering concentration of wildlife. On game drives and walking safaris you can expect to see large herds of elephant, great lion prides, long-necked gerenuks, oddities like the fringe-eared oryx and up to 550 different species of birds. As well as excursions within Tarangire National Park, you’ll also spend time exploring Chem Chem’s private concession. Your adventure now brings you to the Ngorongoro Highlands, stopping along the way for a picnic and a game drive through Lake Manyara National Park. You’ll be staying in a traditional guesthouse close to the Ngorongoro Conservation Area, with great views over the Great Rift Valley. It’s the ideal base for visiting the famous Ngorongoro Crater (the world’s largest intact caldera) with its abundance of wildlife that includes elephant, black rhino, hippo, lion, zebra, buffalo and antelope. As well as an impressive richness of game, the region is known for its spectacularly diverse landscapes and fascinating archaeological remains. Just when you thought the game-viewing couldn’t get any better, you board a flight to the world-famous Serengeti National Park. If you arrive during migration season you can expect to be overwhelmed by the sight (and sound) of hundreds of thousands of wildebeest, zebra and gazelle making their way across the Serengeti. A jaw-dropping migration thought to be the largest movement of land mammals on Earth. You’ll be staying on a private reserve adjacent to the southern Serengeti, a sprawling wilderness home to lion, cheetah, elephant, giraffe, eland, impala, topi and countless birds. During your stay you will have the option to enjoy a variety of activities including day and night game drives, bush walks, picnics and cultural experiences. You now set off to experience something entirely different. A short flight brings you to the serene island of Zanzibar, a historic gem cast into the shimmering Indian Ocean. You’ll spend four nights here at a luxurious resort in the midst of white sand and welcoming turquoise waters. When you’re not relaxing in your private villa you can stroll along the beautiful beach, soak up some sun by the pool or indulge in a treatment or two at the spa. You’ll also have access to a wide array of outdoor activities, from sea kayaking and snorkelling to scuba diving, surfing and stand-up paddle boarding. Excursions to Stone Town, Prison Island and Jozani Forest can also be arranged.